These are the standard patterns for the new buttons provided with CSB 5. You can change font style, font colors, size and background color (to match the color of the page). You can even use specialty fonts! Mouseover them to see the standard changes and click a button to see the new template designs. These samples were all made with the graphical button builder-built-in graphics. These buttons come in several colors (blue, red, yellow, green, black, purple) to coordinate with the new templates that are included with CSB 5. These samples were all made with the graphical button builder-simple changes! to color, font style, size... Nothing made outside CSB! You can even import your own background images to use as button designs! Adjust the width of the image, and type a character! Read more about HOW to make your own buttons here. There are specific rules that must be followed! The built-in buttons that are curved or have bullets ARE NOT transparent. Then put the new images into the Program files area so CSB could access them like normal. This button maker is not as versatile as Xara's button maker, but is faster and easier because the buttons are IN CSB and requires no extra coding insertion or separate program. Adjust the size of the button and background edge color. Currently no button will have transparent edges. longer but keep the button height the same size. Used this technique above on several buttons. If you leave the box checked to maintain proportions, then the button image will stretch wider and taller at same rate. Color choices have no eyedropper. They use the standard WINDOWS color chooser. Not a favorite way to deal with colors but adequate. Eyedropper would be wonderful! Need to match your colors? You can still use the CSB color pallet. 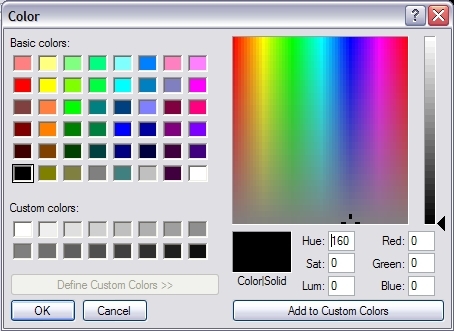 Find your RGB colors for each of the pallet colors here.